The Prince of Tides takes us into the Wingo family and the county of Colleton, South Carolina. It is the story of Tom Wingo and his brother Luke (newly dead) and Savannah (not so newly crazy). Savannah, in Bellevue, has lost large parts of her memory which is crucial to her therapy by Dr. Susan Lowenstein. So her brother Tom, our narrator and hero, is called to New York to tell the stories that will fill in the missing pieces of his sister's memory. The narration of Savannah's ravings, transcribed by Dr. Lowenstein's secretary on page 57 and 58 contain the essence of the stories to be told. "They've taken the snow from the river," e.g., refers to the white porpoise called Carolina Snow that was captured by a Miami Seaquarium. There's lots more stories, each one slightly more fantastic, like the one about the Giant and the Black Widows, or the Cesaer's Salad of Escaped Convicts. The fired, washed-up coach who teaches the wimpy violin player to block the passer, the lunch at the best restaurant in New York, and the Stradivarius shattering into the pickup truck are some of the other stories. This novel gives a new meaning to transference and counter-transference as the red-neck Southerner is forced to tell stories to help a crazy sister who won't let him see her. How he comes to hate, then love, then leave New York provides the movement. It is a summer inside the psyche of a battered family that consists of a neutered coach, a suicidal poetress, and a simple shrimper. 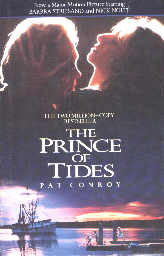 Who is the prince of the tides? Finding out is half the fun. The quest pulls you through the rare slow parts, and the trip is all fun, all the way through. Aside to those of you that have already seen the movie: Luke was left out of the movie and Hollywood chose to focus mostly on the love affair of Tom (Nick Nolte) and Susan (Barbra Streisand). There's a lot more story in the movie than made into the movie.